A Sonoran coral snake (Micruroides euryxanthus). Any of various venomous snakes of six genera in family Elapidae, many displaying distinctive color bands. Over 65 recognized species of New World coral snakes in three genera (Leptomicrurus, Micruroides, Micrurus), native to tropical South America and Southern USA, having bright bands of red, yellow and black. 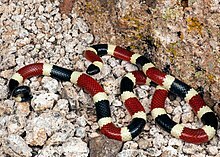 About 16 species of Old World coral snakes in three genera (Calliophis, Hemibungarus, Sinomicrurus), some banded.